Your standards are extraordinarily high for your LMS and that’s a good thing: there will never be a moment when your learners won’t need you to provide them with an exceptional learning experience. Of course by “extraordinary” we mean that you want your LMS to provide an intuitive user interface, core content design components which ease educational innovation, and simple access to critical course data. If you don’t have an enterprise-grade LMS, you aren’t enjoying the above benefits, and you may wonder why your generic LMS requires so much work to function in a CME setting. A generic LMS has one purpose: provide a bare minimum of administrative functions that allow you to launch a course, but not much more. You won’t find tools to make CME course management more efficient, or a quick link to a display of learner engagement data. In fact, if you have a generic LMS you will spend a lot of time helping your platform do its job. That’s because the companies that promote generic LMS platforms companies sell access to software, not comprehensive CME management services. LMS providers aren’t necessarily trying to pull a fast one—a one-size-fits-all platform may work for some CE programs. It’s just not continued medical education. If you have, then your suspicions are correct: your current LMS won’t help you achieve your CME mission. As your program grows, so will your workload as you try to make your LMS behave like a scalable CME management platform. A purpose-built CME platform created by a company with medical CE industry expertise provides the features that CME directors need to scale their programs and maintain educational quality over time. With an LMS built for medical CE, you’ll find advanced business intelligence tools along with an intuitive, CME-focused LMS, providing you with a single platform solution for all of your program management needs. 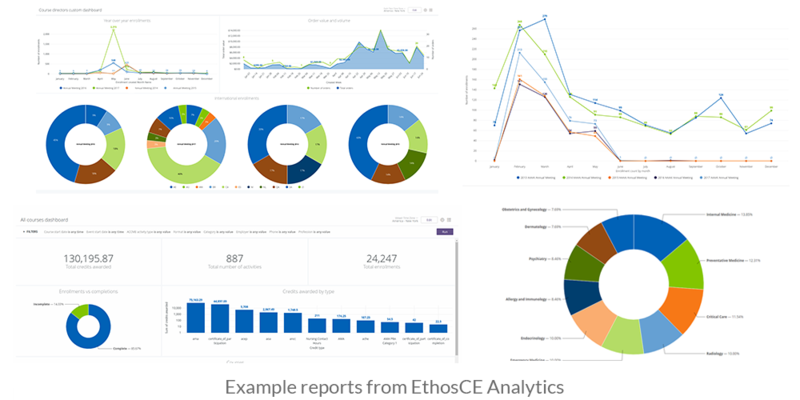 An enterprise-grade analytics suite: Your historical and real-time program data is instantly available to you through EthosCE analytics, a robust analytics suite that’s included with the LMS. With our customizable data dashboards, you can slice your data the way you want, viewing learner assessment performance data and course completion patterns, for example, by demographic group or geographic region in real time. Learn more about advanced data exploration. Automated data management: Compiling “clean” data doesn’t have to cost you and your team weeks of productivity. With EthosCE Analytics, data scraping and management is automated. You won’t have to scroll through spreadsheets looking for the errant number that ruined the findings on your report. Our system pulls data directly from the LMS and a selection of external sources eliminating the prospect of human error corrupting your insights. That data also helps you maintain ACCME reporting compliance with accurate data handling. Learn more about touch-free automated data management. Advanced data visualizations: With EthosCE, creating advanced data visualizations is a matter of a few clicks, not days of graphic design work. With all of your program data always at hand in your data dashboard, it’s simple to generate and share data visualizations with your entire organization. Each data visualization can be customized easily to present the insights that you select in a dynamic format, allowing you to summarize complex historical and real-time data on a single page. User-friendly multi-platform content: With our LMS, it’s easy to add multimedia elements such as video or animation to activities content. We understand that medical CE content is complex, and medical professionals don’t have time to waste with outdated e-learning methods that can’t easily handle the depth and range of topics that CME often covers. The ability to create innovative activities content isn’t an option, it’s a must for medical CE. Learn more about our LMS design features. Unlimited technical support: While we don’t believe that technical support is really a special “feature”—it’s important to note. 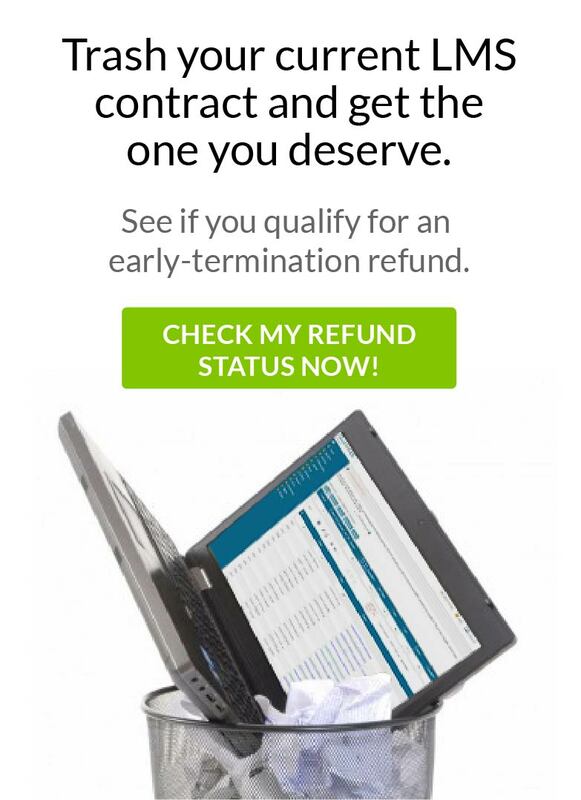 A generic LMS provider looks at on-going support as an extra, not a consumer right. At EthosCE, we look at our clients as partners—and as partners we believe that support doesn’t stop once you’ve purchased access to our platform. We believe that your LMS should be much more than software. Learn more about how we support our partners. It’s time to get an LMS that was designed for you. The audience for medical CE has different needs than that of other CE learners. A generic LMS created by a company without medical CE industry expertise can’t meet the needs of a growing CME organization. Generic LMS providers only offer software access, not the support, purpose-built activities design, or powerful analytics that CME directors need to grow their programs. One-size-fits-all LMS services can hinder CME program growth, by draining team productivity as faulty administrative task “solutions” require either the purchase of extra LMS features or DIY quick fixes. The EthosCE LMS offers unique ACCME compliance tools such as advanced data reporting that CME directors need to maintain alignment with professional CME management standards. EthosCE provides advanced CME operations and business intelligence services out of the box, allowing CME directors to manage all of their data, reporting, CME administration, and curriculum development on a single platform. To learn more about how EthosCE can help you and your business, connect with us today for a 1-on-1 demo!